I was not hungry. Just my stomach was crawling for food. At first I thought of going for Serdang curry mee but I ended up at Seri Kembangan McDonald’s. 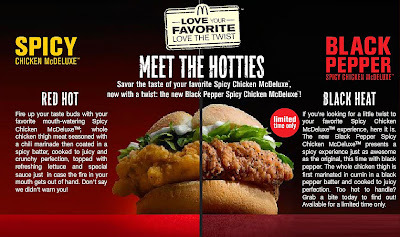 My friends had been telling me how delicious Black Pepper Spicy Chicken McDeluxe was. It had been on McDonald’s “Limited time menu” for some time but I had not tried even once. Just I did not go to McDonald’s recently. heehee. Anyway, I hope it was not too late to try. Indeed still consider lucky as I am still in time before the promotion ended. 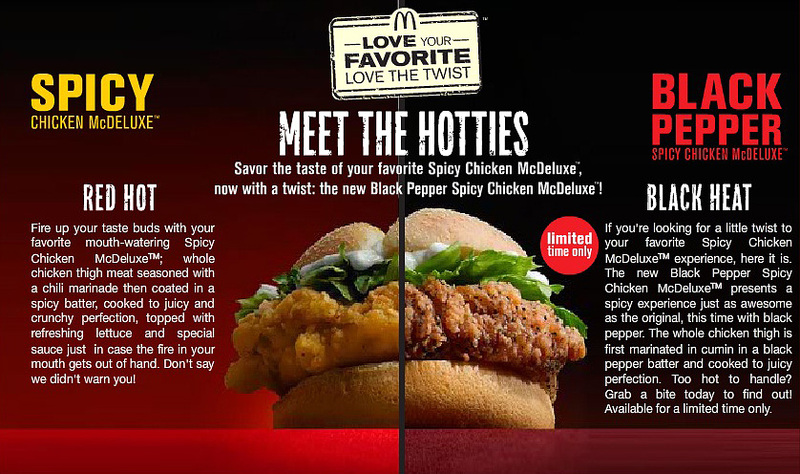 Spicy chicken McDeluxe or Black Pepper Spicy Chicken McDeluxe??? How good if I can order half or each…hee. I chose the fiery one. The presentation of the burger was not appealing. The meat patty was thick, but looked dry. My girl only have a few bites of the burger and her first comment was: “Why no black pepper taste? Only got indian spice taste.”. Too bad I was not the founder of this burger else I might able to answer the question. heehee.It was not as delicious as I first thought. I am not dissapointed because it was still a good one. The patty was juicy though it looked dry on the outside. Meaty, chewy and juicy, one is never enough for me. 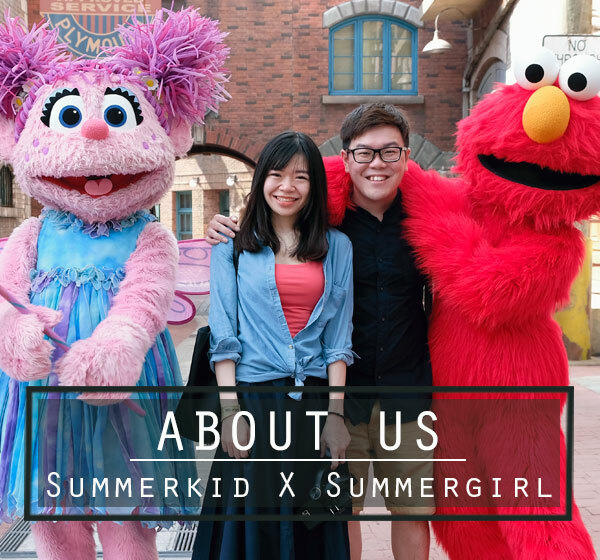 In short, I still prefer chicken McDeluxe.